Our customers take pride in their homes and our residential housekeepers take pride in the services they perform. A job well done means creating a healthier, cleaner home that provides our customers more time for their priorities. As a result, many customers thank us for offering such trustworthy, reliable house cleaning services. We are pleased to share the testimonials of our satisfied customers, and we would also like to Thank all of our customers for being loyal to us! 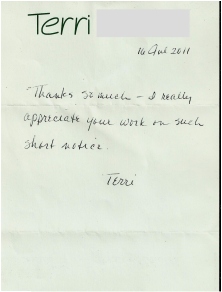 This letter is from one of our Customers who needed us to come in asap to disinfect and sanitize her mothers house so she could come home from the hospital with weak immune system, we made sure everything was sanitized and disinfected so her mother would not get sick!